GRUT vs Colorado in the Final. Photo by Ingeborg Kuijlaars. 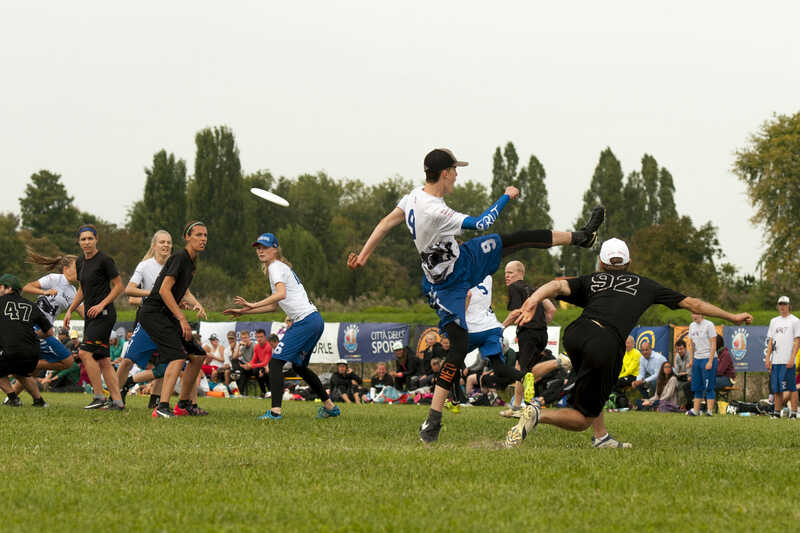 The mixed division at the European Ultimate Championship Finals (EUCF) was arguably the most competitive division at the tournament. With huge amounts of parity in both pools of six and only four teams advancing to semis, things heated up early on in pool play. In the end GRUT from the Netherlands took gold over Colorado from Karlsruhe, Germany. This only came after two double game point semifinals where Colorado squeaked past 2016 EUCF title holder Reading from England, and GRUT overcame Hässliche Erdferkel from Marburg Germany. Three Central teams entered the mixed division: Colorado, GRUT, and Hassliche Erdferkel. All three teams made semifinals. Make no mistake: it was not an easy road to get there. GRUT had to get past the likes of Scotland’s Black Eagles and even took a loss to the Swedish powerhouse ViF. Colorado and Erdferkel, on the other hand, needed to finish above the red hot Czech Terrible Monkeys and SMOG from the north of England. Colorado actually fell to SMOG in pool play but still managed to win their pool. All three central region teams were great, but GRUT were definitely the best on the weekend. Despite their loss to ViF, which occurred after they had already secured a spot in the semifinals and early hiccups in their first game against Os Zla, they were simply the class of the mixed division. This team has an average age of 19.6 and has a starting O-line handler, Anne Minnaard, who is 15 years old. This team has traditionally been a playmaking team of all stars but this year they showed themselves to be a much more complete unit. This helped their O-line to push through zones and their D-line offense was able to capitalize on break opportunities much more effectively than they were able to at Windmill earlier this year. Once they got through pool play they had to face their first mental challenge against Hässliche Erdferkel in the semifinal. Erdferkel vs GRUT is a rematch of the 2016 semifinal that went to double game point. Somehow this semifinal was even more exciting. Erdferkel’s offense is almost completely run through Chrstian Hamann. GRUT’s Tjeerd Ates was given the task of matching up with Hamann throughout the game and could generally stop Hamann’s first and second moves, but Hamann still managed to always get the disc eventually and use his elite level disc skills to move the disc through his teammates to get a score. GRUT, on the other hand, had big plays from Joris Steneker this game but was simply playing a good team game on both their offensive and defensive lines. However, as the game came to a close, Erdferekel found themselves up 14-13 and a GRUT mistake gave them the opportunity to punch in a score for the win. A huck went up with a wide open Erdferkel defender, but GRUT’s Floor Keulartz used her closing speed and leapt to a shoulder high layout to get the D to save the game for the Dutch kids and managed to score a point to bring things to double game point. This time, it was Lola Dam’s turn to get the D and the score, a layout grab off a hammer from Steneker giving GRUT a spot in the final. Colorado also dispatched Reading in an exciting double game point thriller so everyone was excited to see these two teams face off in the final. GRUT had beaten Colorado at EUCR-South, but that was without Colorado’s Filip Stepniak, who was busy with the Polish World Games team that weekend. Stepniak was there this game and made some incredible plays. Oliver Jung and Felix Glöde also made large contributions on the male side with Gerlinde Utsch and Sabine Mannherz impressing as phenomenal deep targets on the female side. Though Colorado looked excellent, they were simply no match for GRUT this time. GRUT scored in a variety of ways in the final. Whether it was allowing their female handlers to calmly demolish whatever zone Colorado could throw at them, or having Ben Oort throw a pinpoint backhand blade just arching over Floor Keulartz’s defender, everything was simply clicking for GRUT. In the end GRUT were up 14-12 and gave Colorado a chance to score. A big huck went up but Iris Leninga made a stunning layout D. As the GRUT line celebrated they realized that the throw had to go back on a foul call. In the end Lawko van der Weiden, who had a great game up until now, got a catch block very close to Colorado’s attacking endzone and with some quick disc movement GRUT had secured the gold medal. At the moment, GRUT does not have a bid to WUCC as the Netherlands did not have a national team at WUGC last year, making their chances to earn a bid very slim. Moreover, many of the girls on GRUT are gearing up for their last hoorah as the Dutch National U20 Team at WJUC next year in Canada; two trips to North America in the same year may not be feasible. To say there were doubts about Reading going into this tournament would be an understatement. After coming in third at UK Nationals, they were only even granted a spot to the EUCF after the Spanish Guayota cancelled and the European Ultimate Federation was unable to find a replacement in the South and West regions. Reading came into their pool as the six-seed but shook things up early, beating UK rival Black Eagles in the first game of the tournament. They did lose to GRUT quite convincingly later in the day but this could partly be explained by the lack of Mark Bignal, who was only able to show up for Saturday and Sunday games. Bignal made huge contributions to the team once he arrived, including a Callahan against ViF. Sam Gunbie helped to fill in his shoes on Friday. Rebecca Palmer and Tereza Menclova were both targets that most teams had a very rough time trying to stop. Only losing to GRUT in pool play and Colorado in semis, Reading managed to beat Erdferkel in the bronze match to hang another medal next to their 2016 gold. This team shows that they should not be doubted and are one to look for on the road to WUCC next year. It has to be mentioned again that there was unbelievable parity in this division. The top four teams mentioned above suffered losses to SMOG and ViF. Terrible Monkeys were also on the cusp of making the bracket but couldn’t get crack through. SeE6 also finished relatively low this year but this was partly due to a large number of players getting stuck at the airport for early games on Saturday. They were able to push Erdferkel to a double game point match once they were at full strength. The Black Eagles were on most people’s radar as a title contender, but just a few lapses of focus against Reading and GRUT proved fatal for their chances. Their fall from prominence continued, as they lost to Terrible Monkeys in the consolation bracket, but this team looked incredible when they were clicking. The Eagles definitely have what it takes to make big plays on both sides of the disc against any team in the world, but they will have to fix their consistency issues if they want to go deep at the WUCC next year. Comments on "EUCF 2017: Tournament Recap (Mixed Division)"